The sports section is assembled in the composing room. 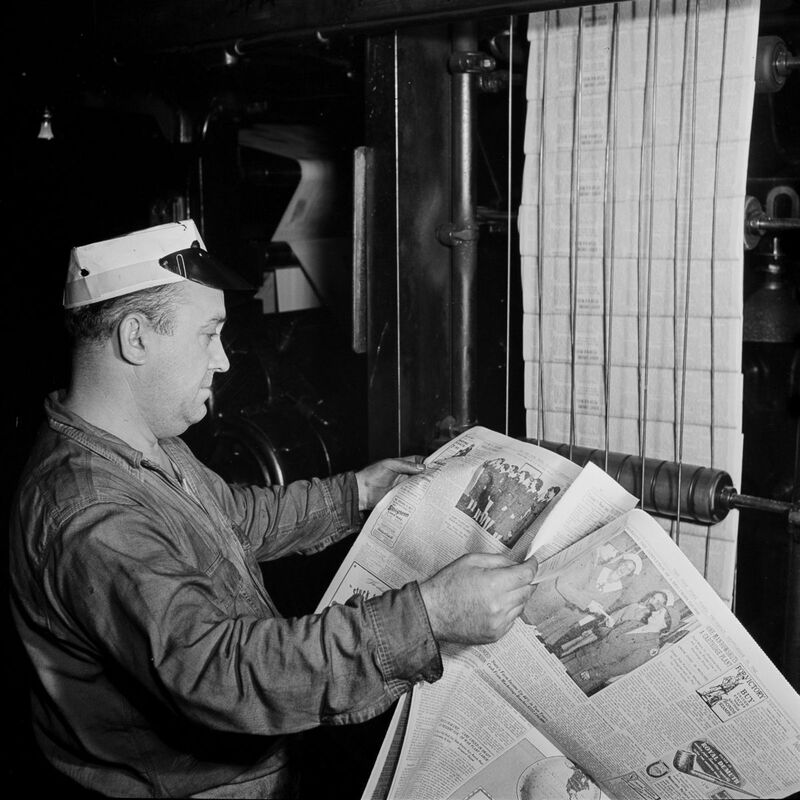 Long before the age of computerized printing presses and journalists being able to file stories via computer, the process of creating the day’s newspaper was a much more arduous, hand-made process. 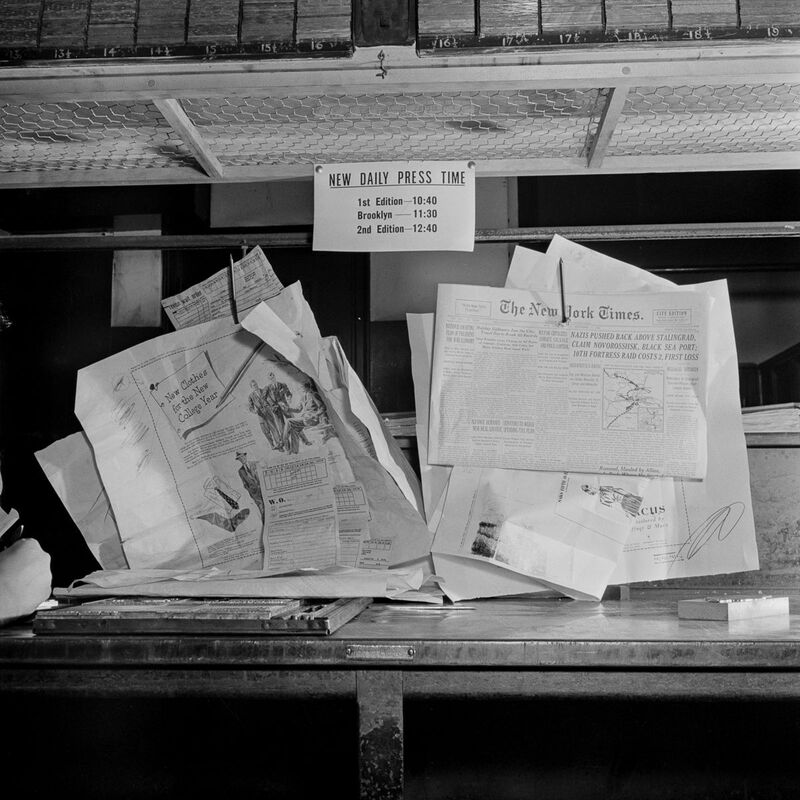 In September 1942, Office of War Information photographer Marjory Collins paid a visit to the offices of the New York Times, located at the iconic One Times Square and an annex on 43rd Street. 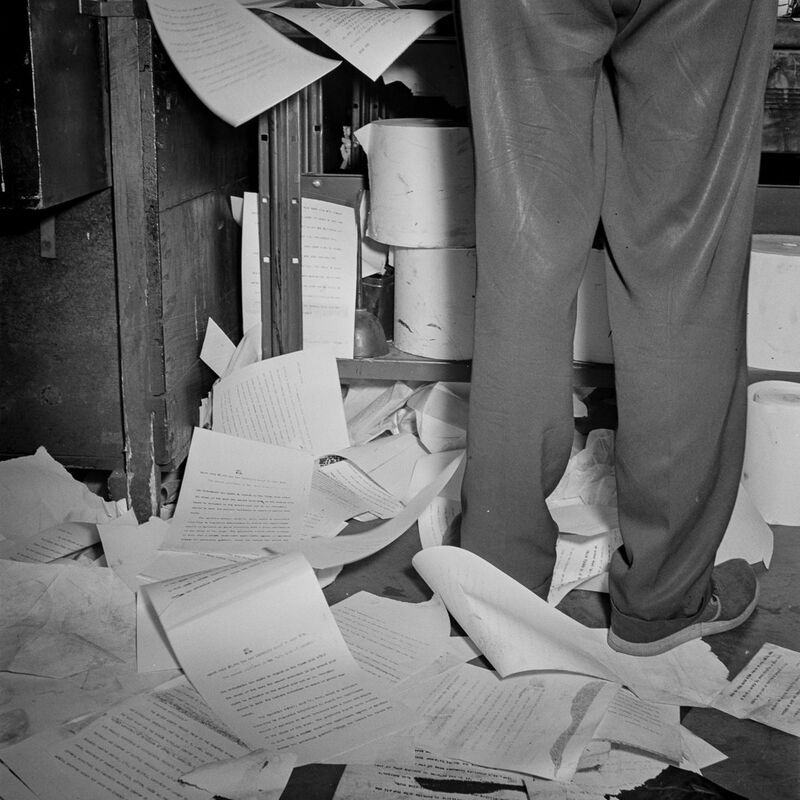 There, she documented each step of the messy, physical process as news coming in over the wires was sorted, edited, rewritten, laid out, and printed, all under an ever-approaching deadline. 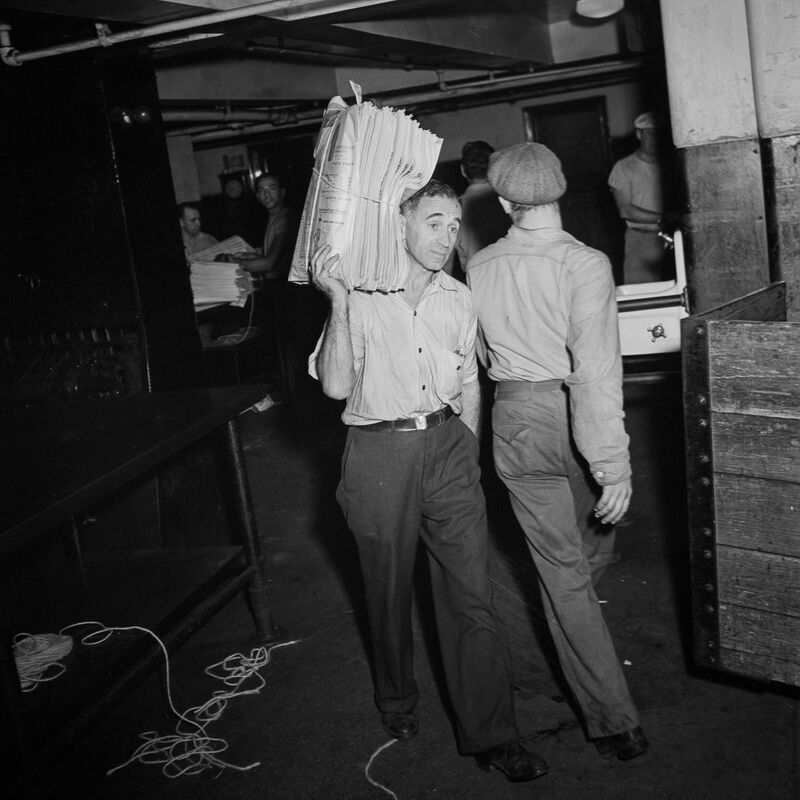 The Thursday, Sept. 10, 1942 issue was dominated by news of fighting in Europe and the Pacific, as well as rationing and cutbacks on the home front (along with recaps of a Yankees victory over the Browns and horse races at the Aqueduct Racetrack). 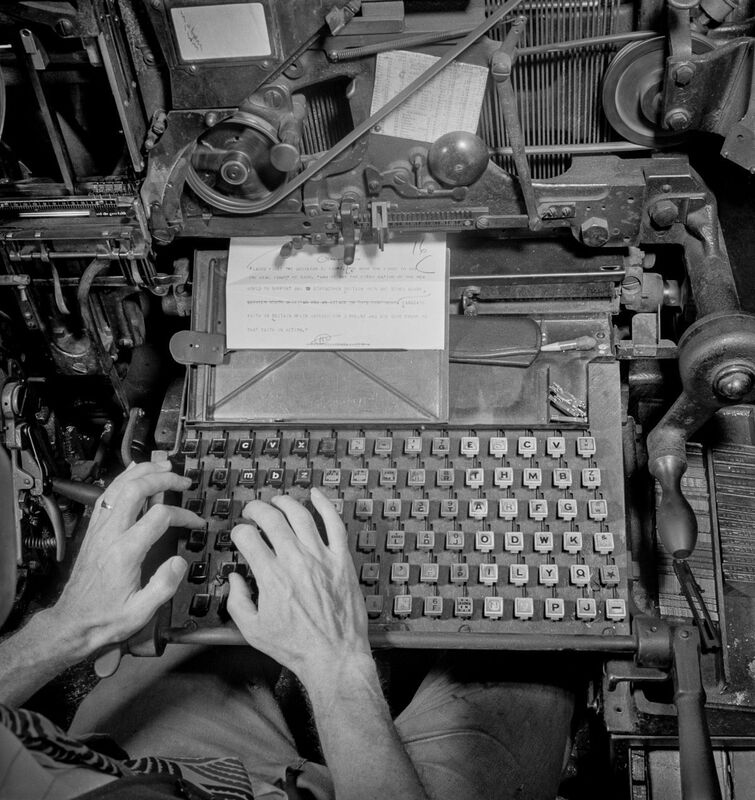 “Hot type” is shorthand for the widely used hot metal typesetting method invented in the 19th century. Typesetters created lines of text using brass letters, then injected molten lead into the mold. 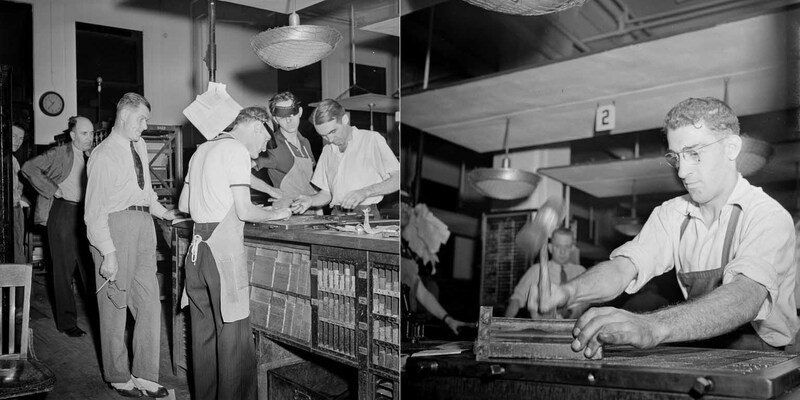 The resulting plates were used to print books and newspapers. Afterward, the lead was tossed back into a “hellbox,” melted down again, and reused. This technology had several advantages: it reduced labour since type sorts did not need to be slotted into position manually, and cast crisp new type for each printing job. 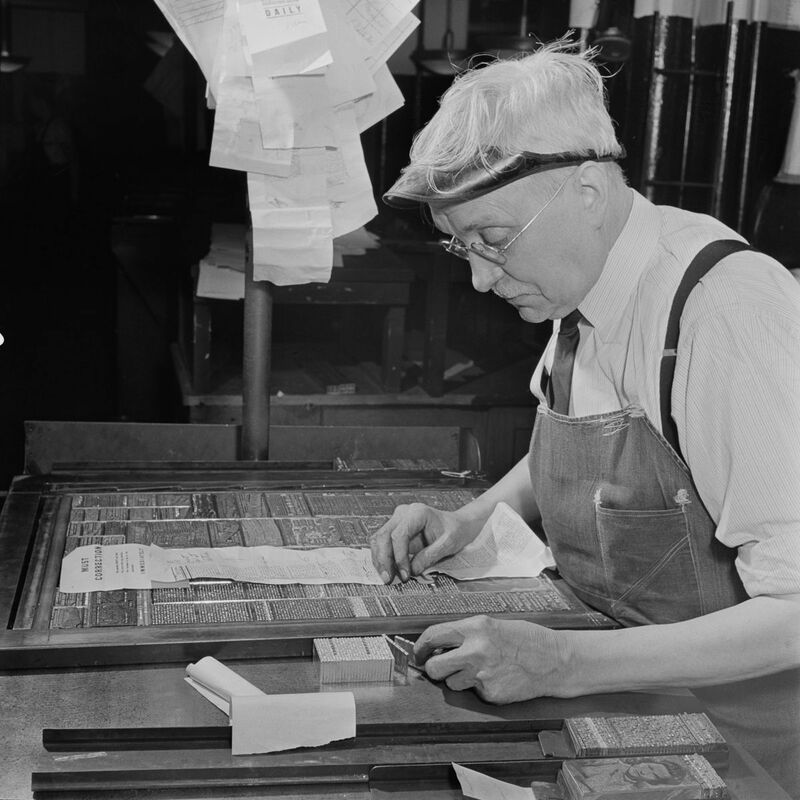 In the case of Linotype machines, each line was cast as a robust continuous block (hence “line o’type”) which was useful for rapid newspaper printing. 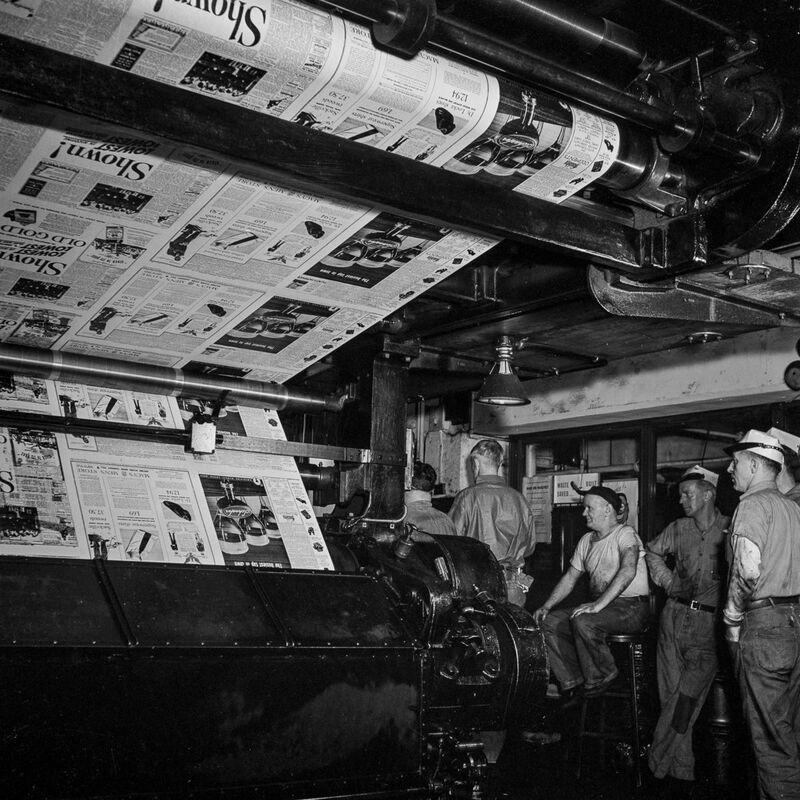 It was the standard technology used for mass-market printing from the late nineteenth century, finally declining with the arrival of phototypesetting and then electronic processes in the 1950s to 1980s. The newsroom. 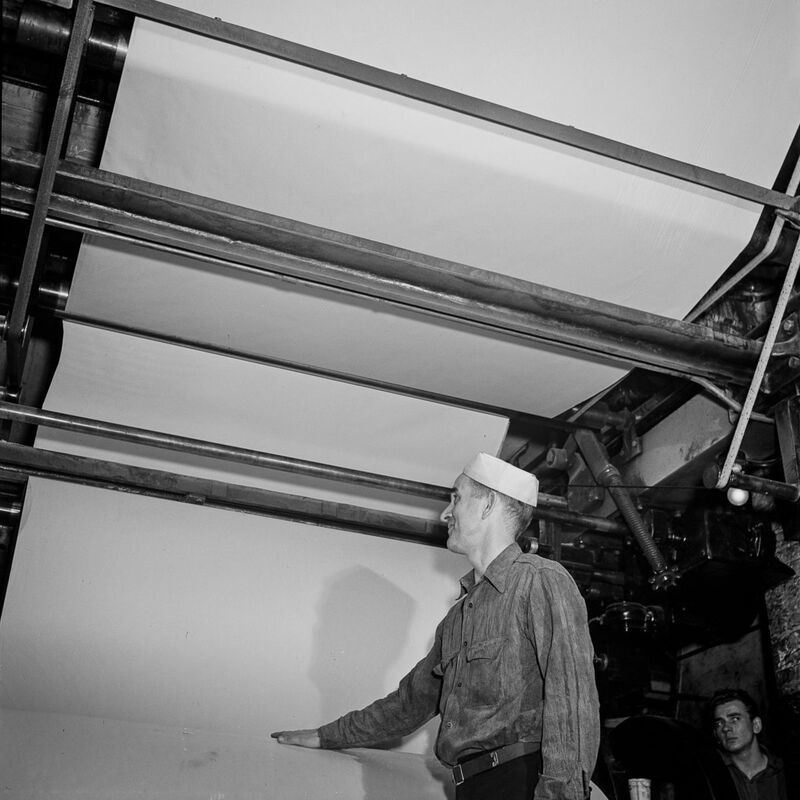 A conveyor belt carries completed copy up to the composing room. In the bullpen. 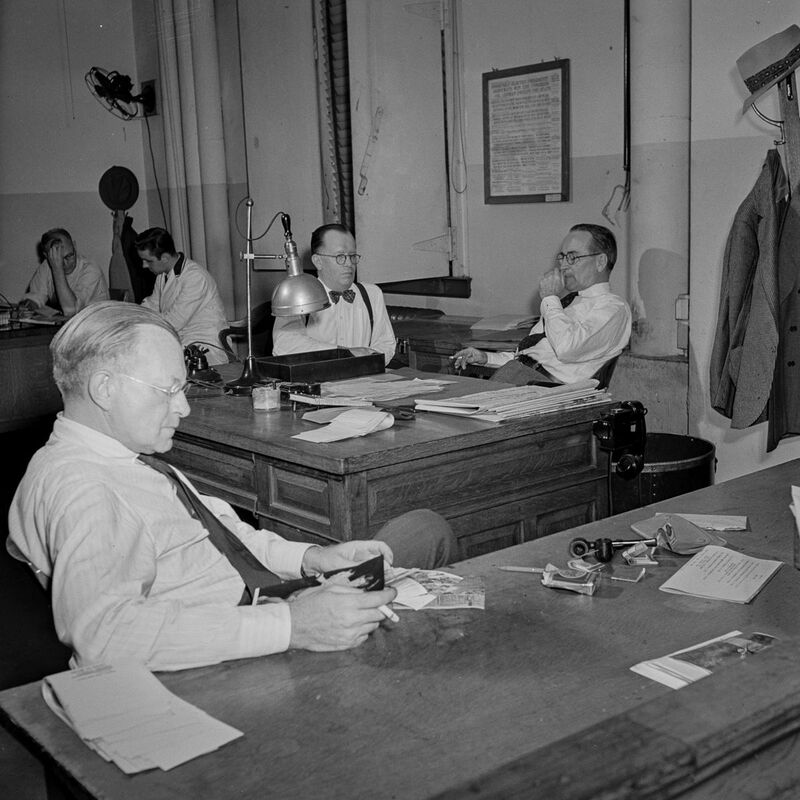 The assistant managing editor sits in the foreground while the managing editor and night managing editor confer in the background. 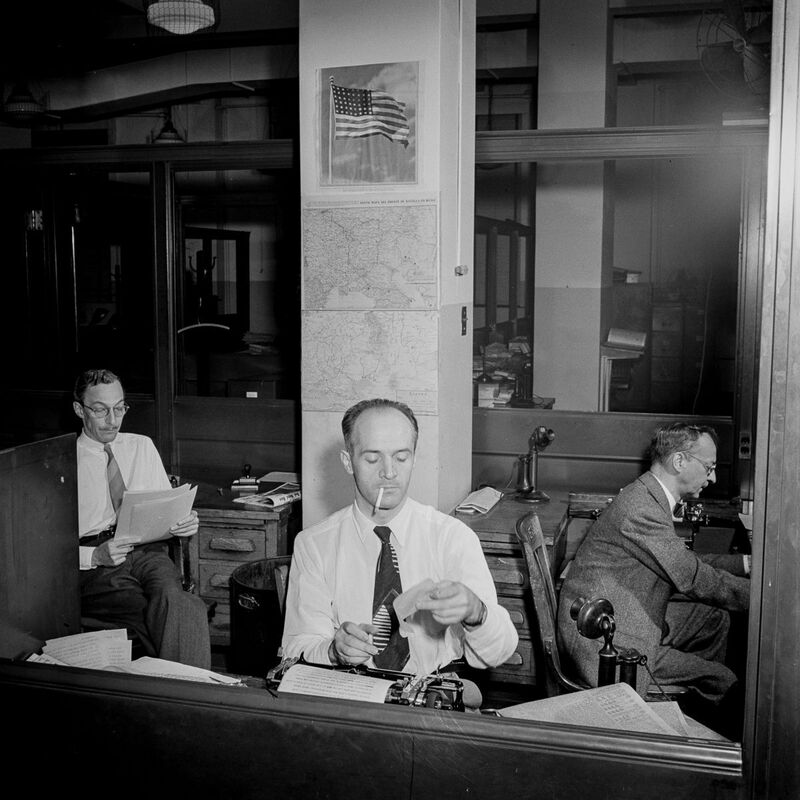 In the wire room, telegraphers record messages received by Western Union and Postal Telegraph from Times correspondents across the United States and abroad. An incoming dispatch from the Associated Press. 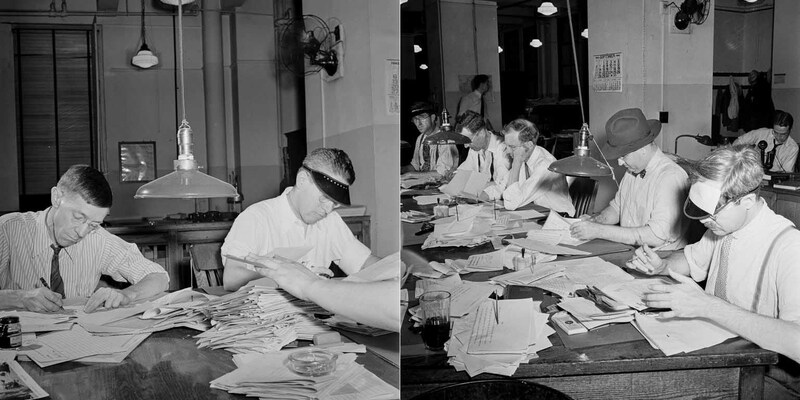 Copy boys mimeograph the dispatches from the telegraphs and pass them through a slot to the newsroom, where they are sorted and distributed to the various desks. 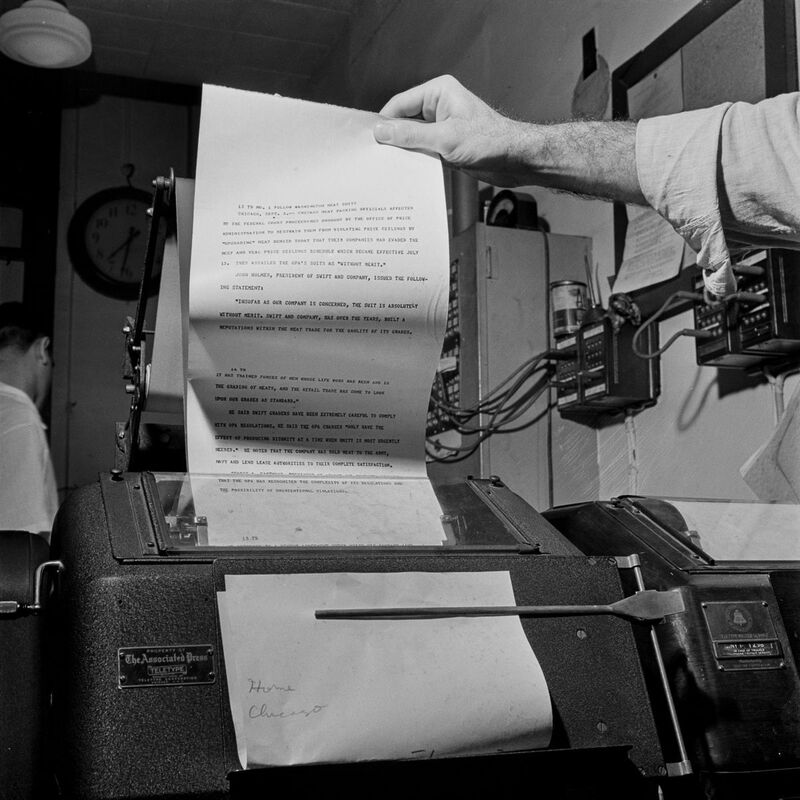 Dispatches pass through the mimeograph. 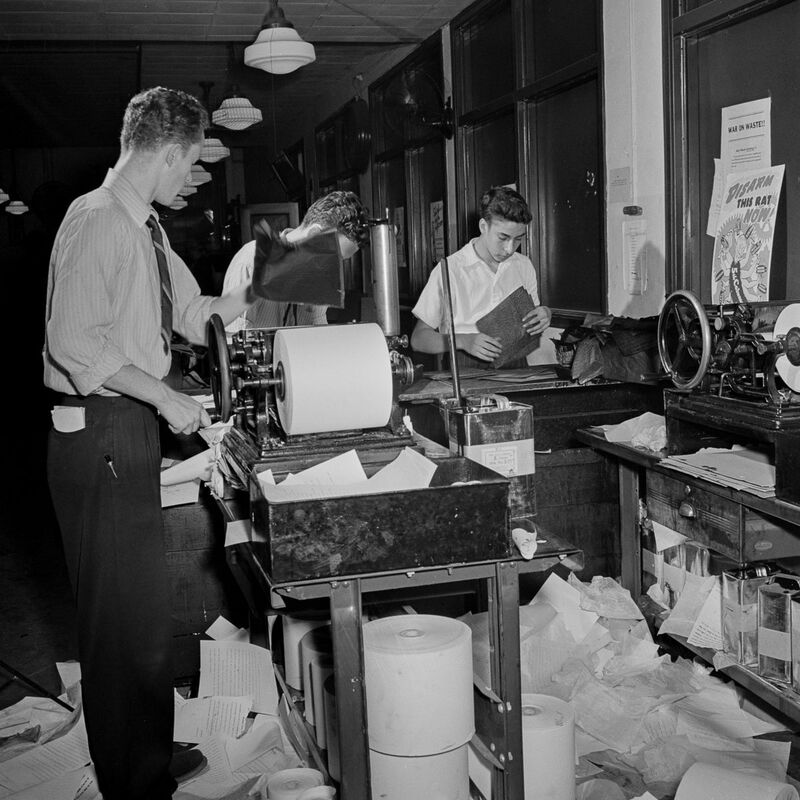 Dispatches have to be mimeographed so fast to meet the deadline that many copies fly out of the machine onto the floor. (Left) Copyreaders at the foreign desk in the newsroom. In the foreground, the foreign editor discards a story by “spiking” it. 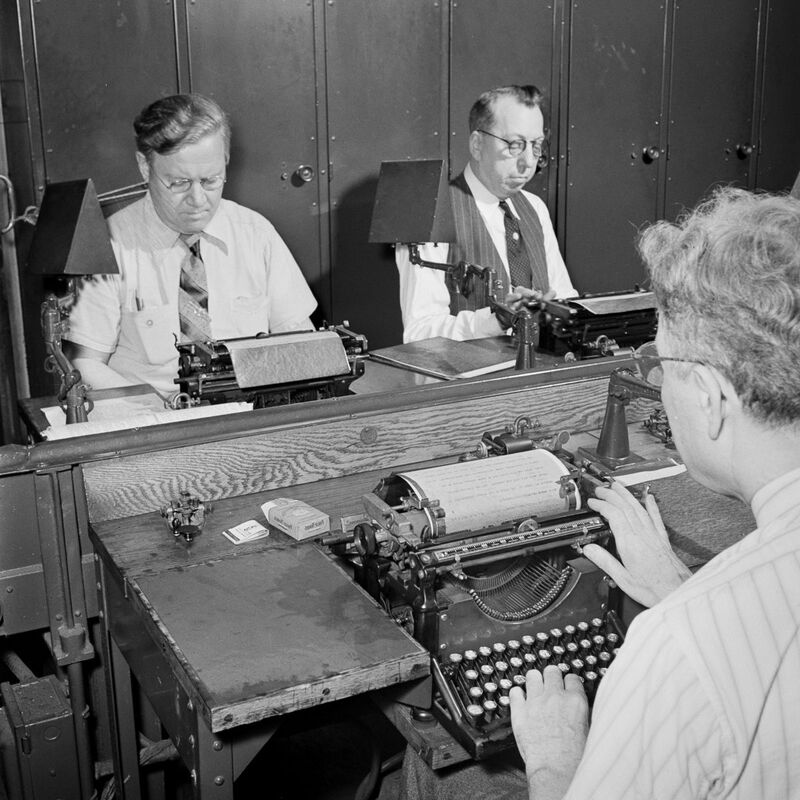 (Right) Copyreaders at the telegraph desk, which handles all U.S. news outside of the city. Argentine, Swiss, and Mexican correspondents. Drama critic Brooks Atkinson pens a review of a new play. 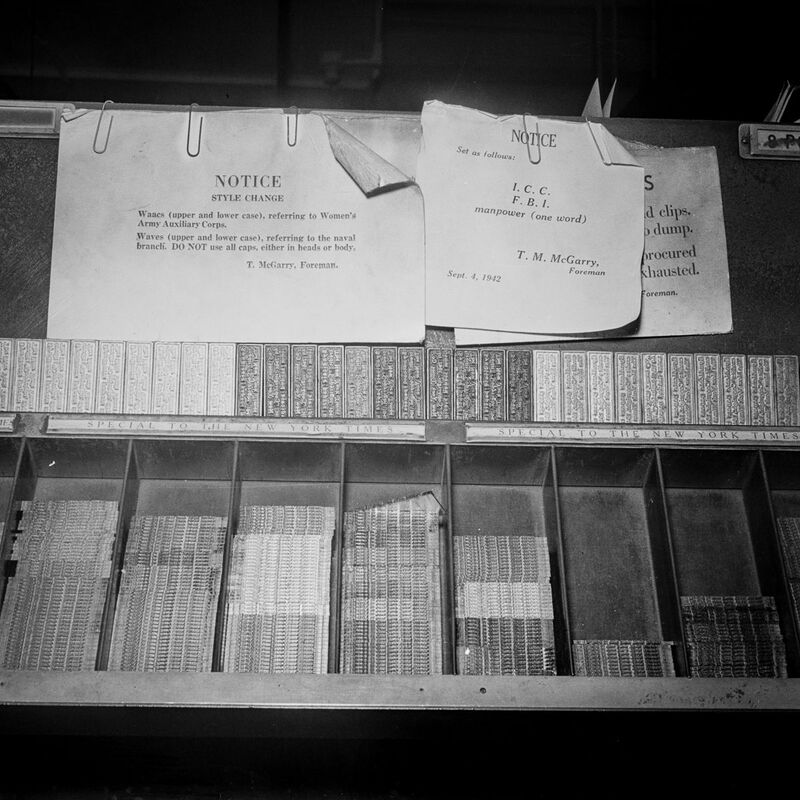 (Left) Old and new dictionaries in the “morgue”. 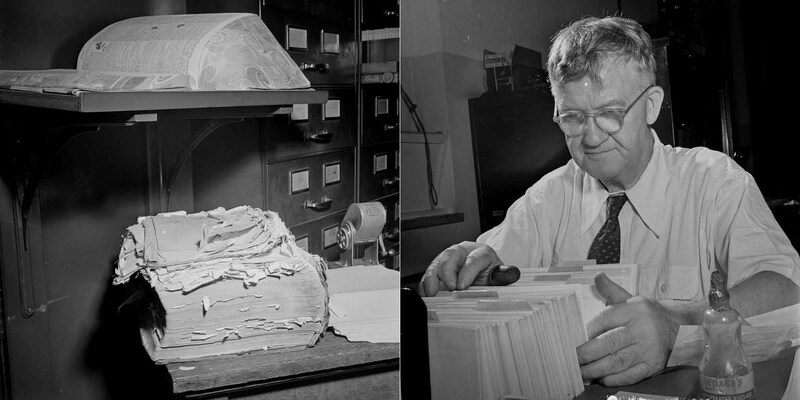 (Right) Tommy Bracken, a 51-year employee and head of the morgue. 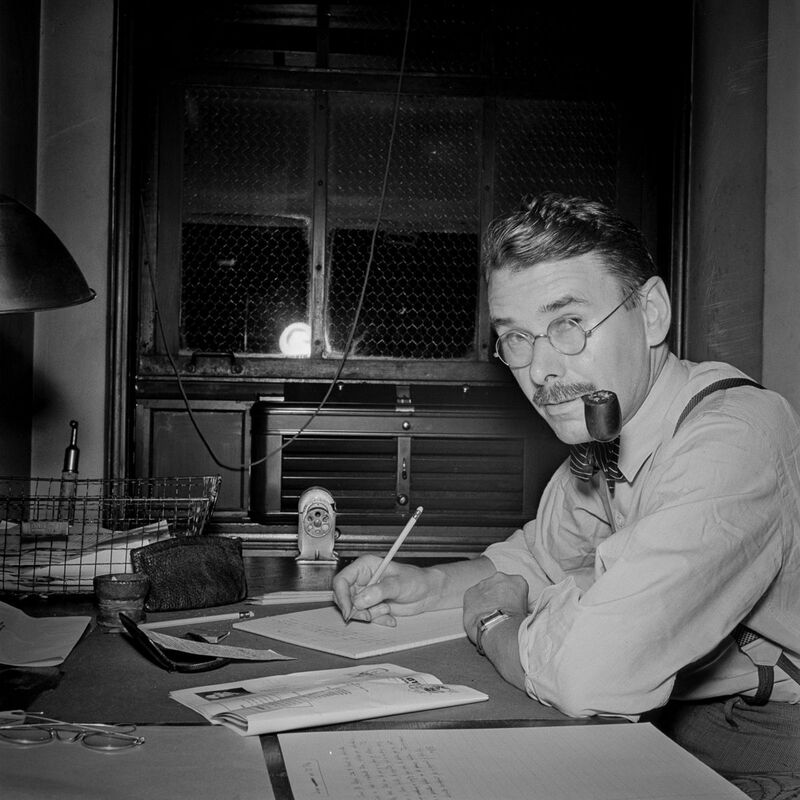 A radio operator listens in to Axis propaganda broadcasts. 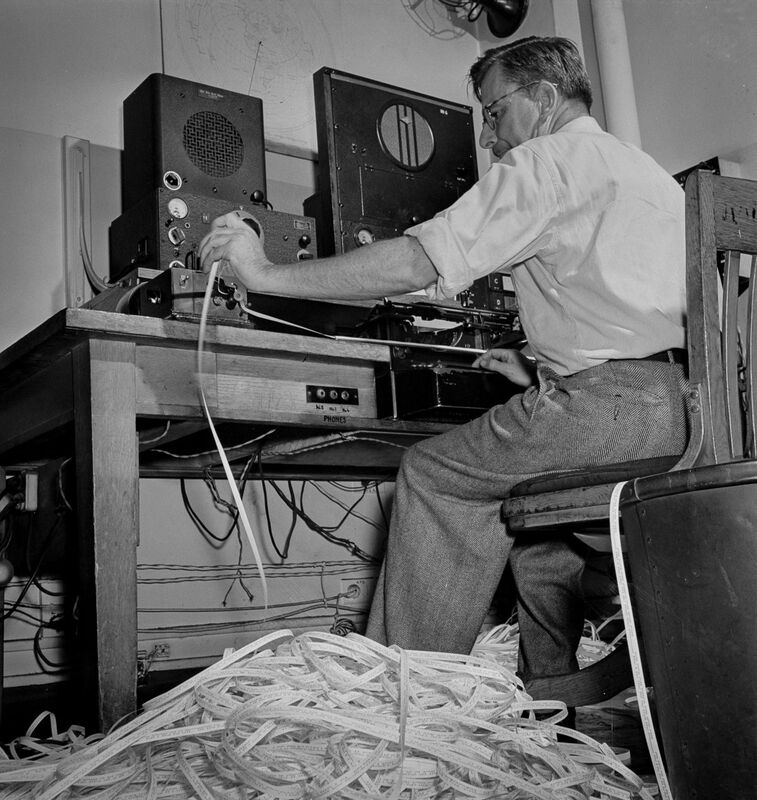 The paper piled on the floor has been examined to see what has already been covered in the last edition. 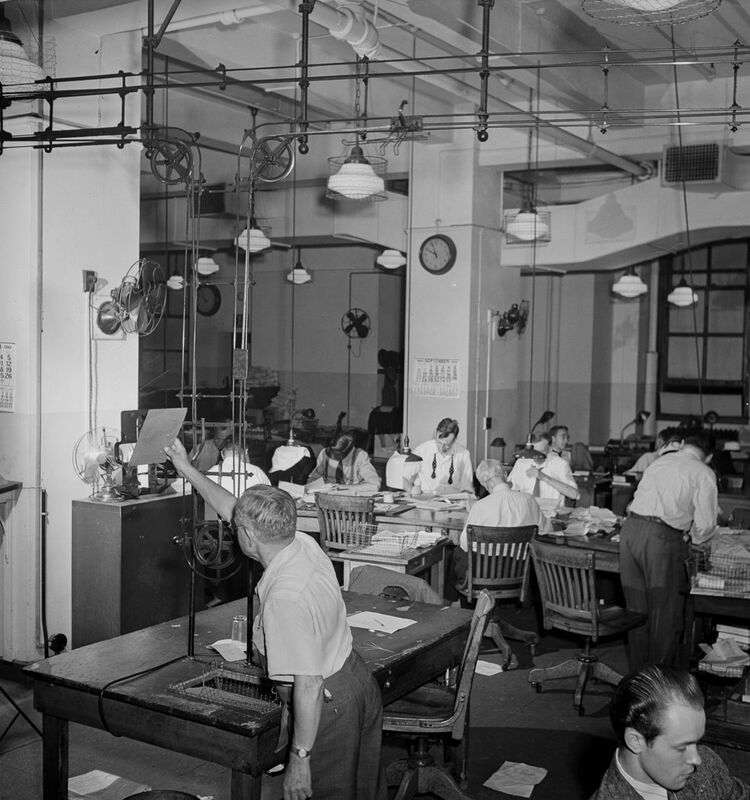 (Left) In the radio room, news is sent out twice daily in code by the Times’ short wave transmitter and received by ships. (Right) A short wave radio operator receives and records messages from a correspondent in Switzerland. 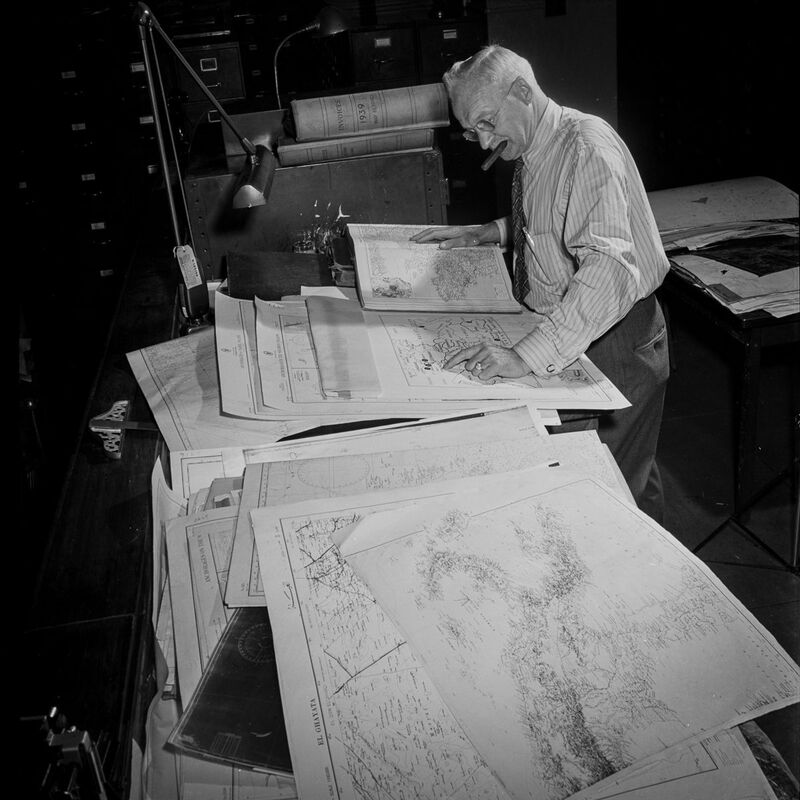 In the art department, the cartographer consults charts to prepare a map of the war in Europe. This employee was also here for the First World War. The photo department. 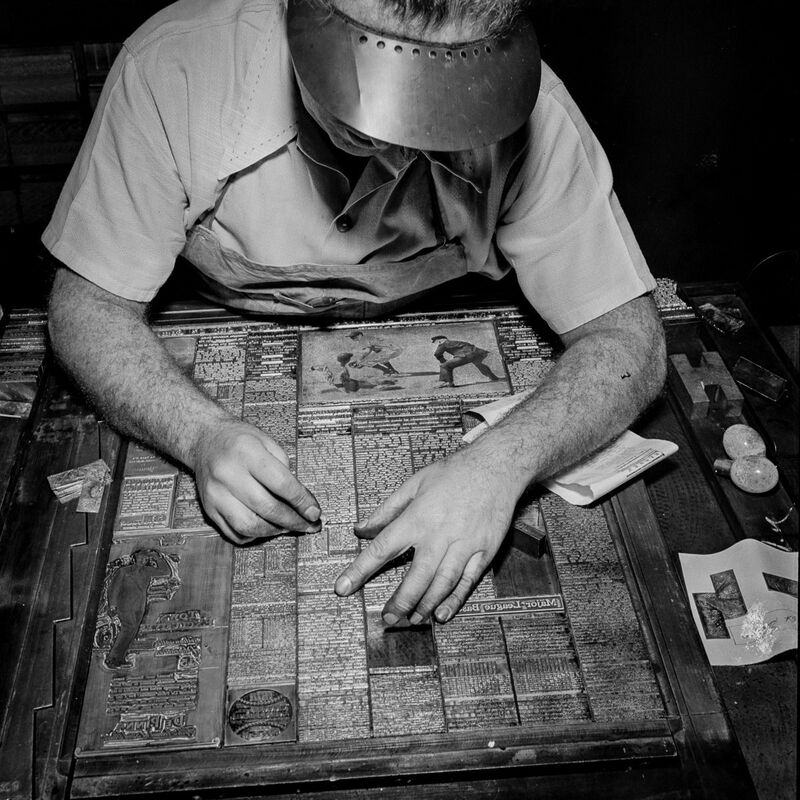 The Times syndicates its photographs all over the world, sending some by clipper to Europe daily. 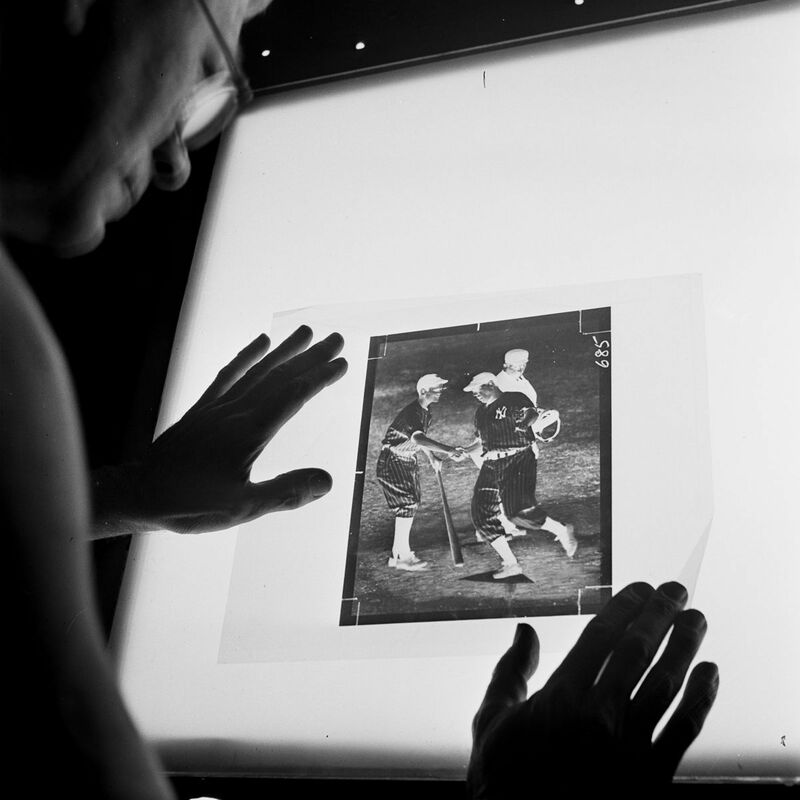 A darkroom technician inspects the dots on the screen of a strip negative before it is transferred to a zinc plate. 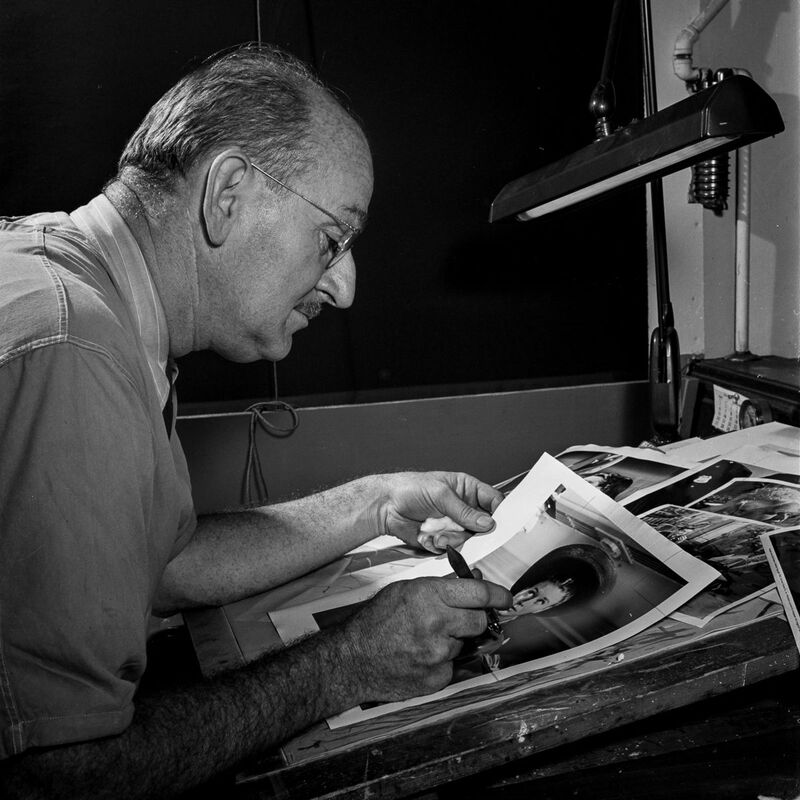 An artist retouches a fashion photo for the Sunday edition. (Left) (Completed mats are checked on board by page, then sent down a chute to the stereotype room. 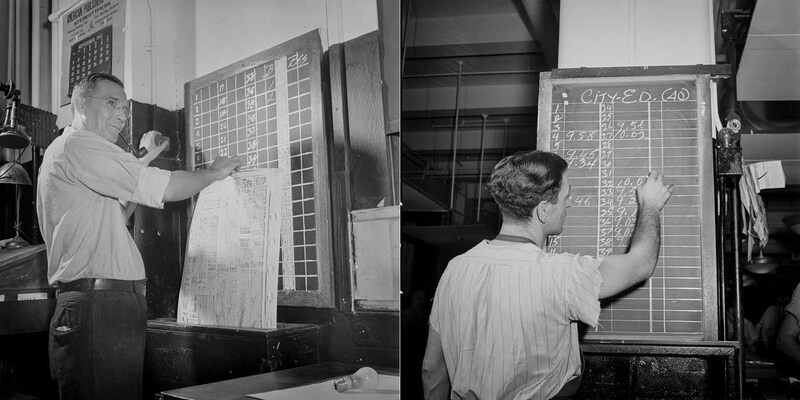 (Right) As make-up of each page is completed, time is marked on a board. 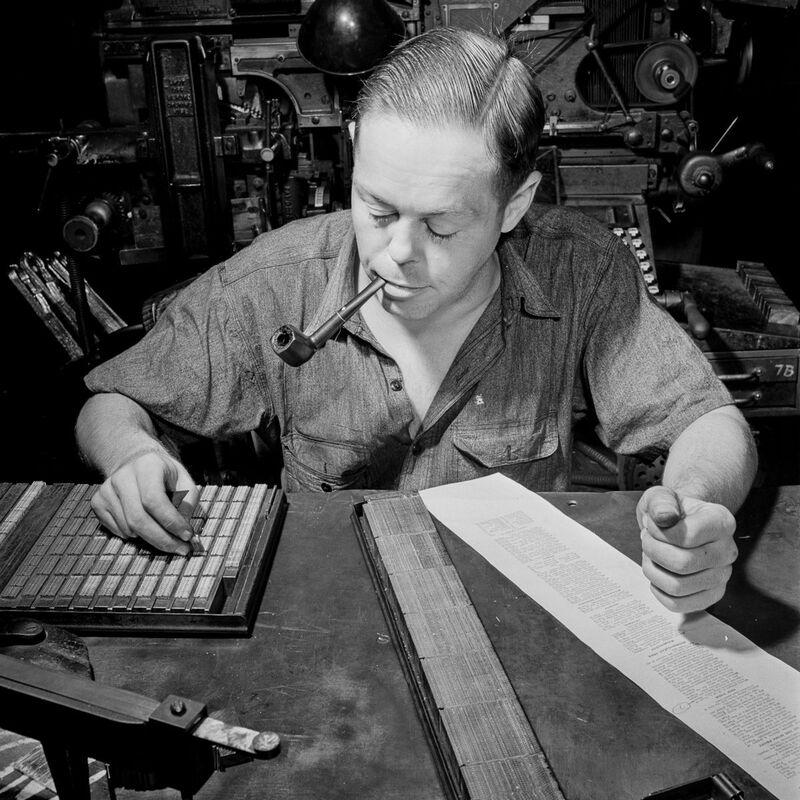 A linotype operator types out a story in the composing room. 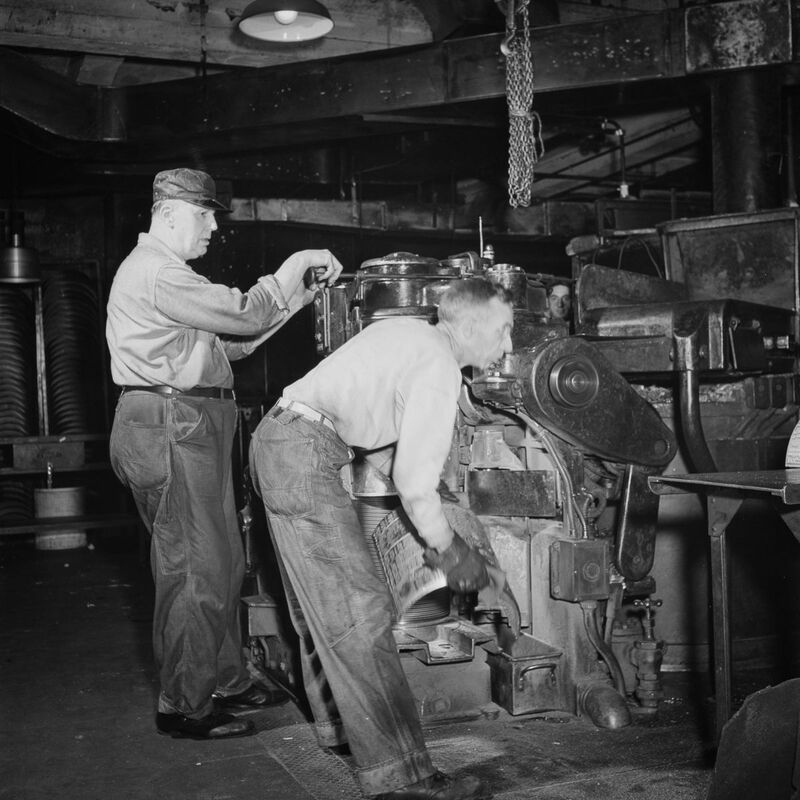 The linotype is used to cast metal blocks of type which will then be laid out into a page. Notices on style changes are posted in the composing room. (Left) A mat is inspected for faults and blemishes. (Right) The proof press turns out proofs for distribution to make-up editors for correction. Making up a page in the composing room. 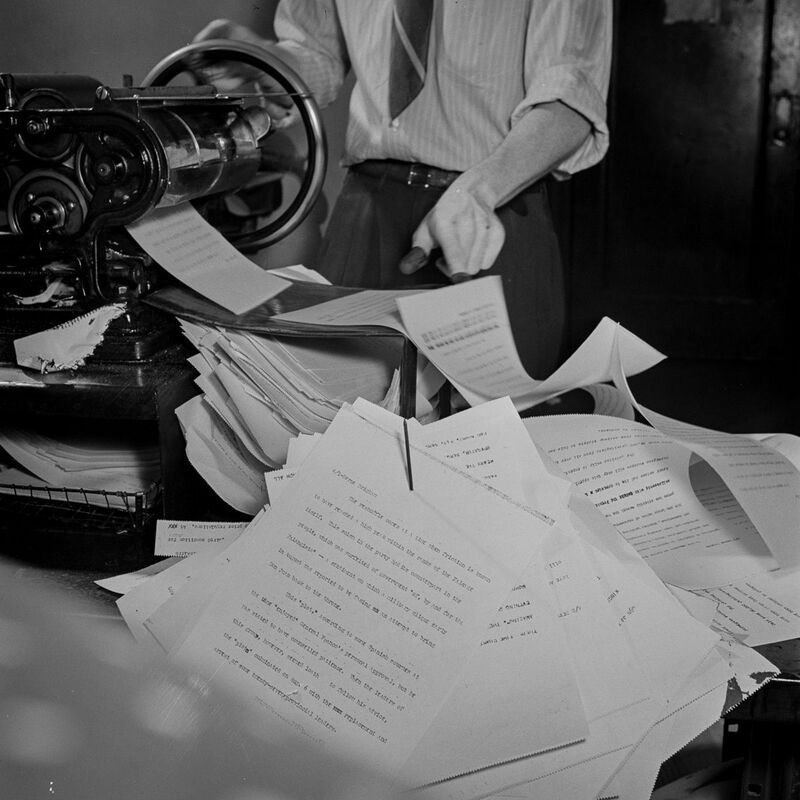 In the composing room, the daily index to the news is set partly by hand. This man has been doing it for fifteen years. Proofs on the wall in the composing room. (Left) Page one is made up as the deadline approaches. (Right) Type is hammered down on a completed page. In the reel room, pressmen transport a 1608-pound paper reel to the presses. The reel has enough for about 1300 newspapers. 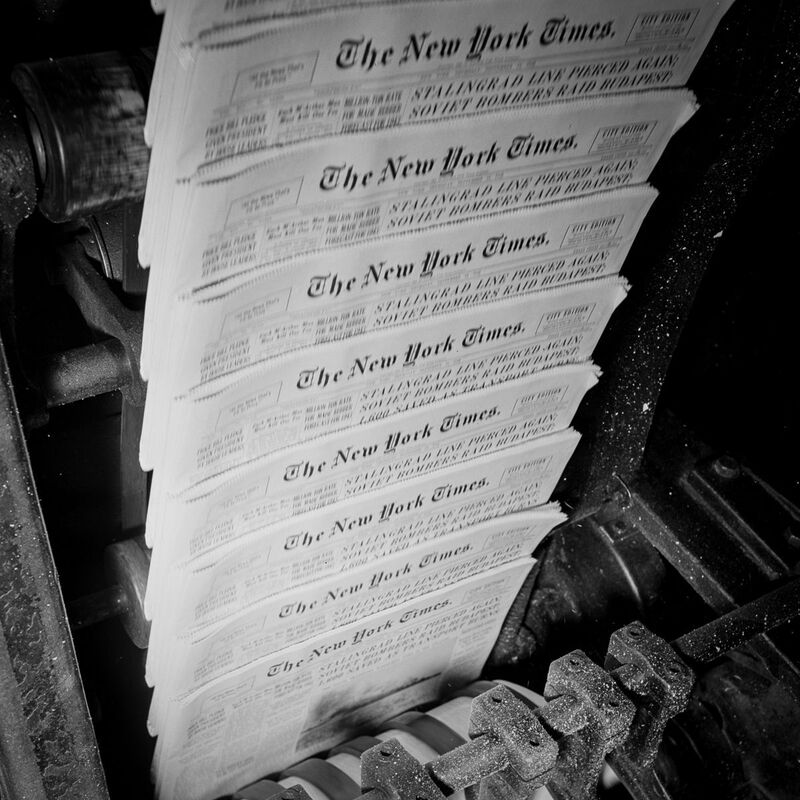 Threading paper through the presses. 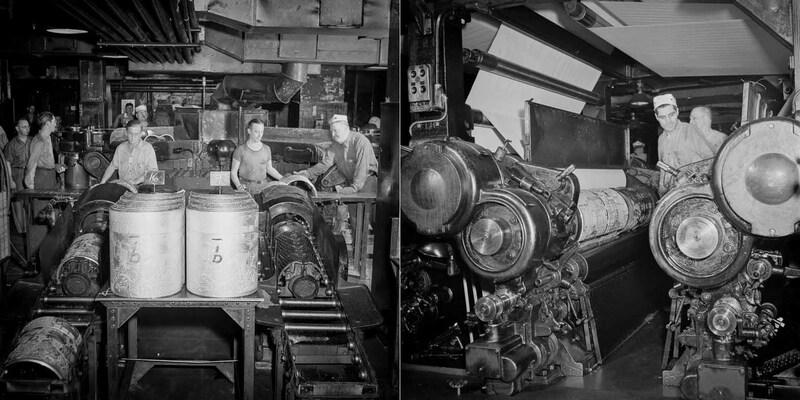 An Autoplate machine is used to cast curved plates for the printing presses from the completed linotype slugs. (Left) Page numbers are applied to cast plates for easy identification. 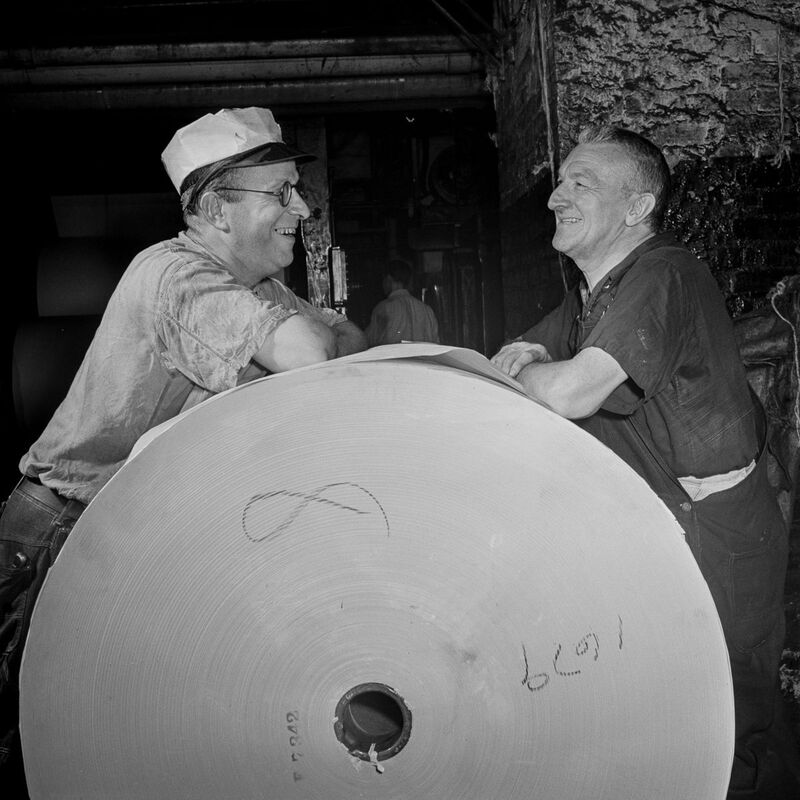 (Right) Plates are loaded into the presses. (Left) Freshly cast and numbered plates. 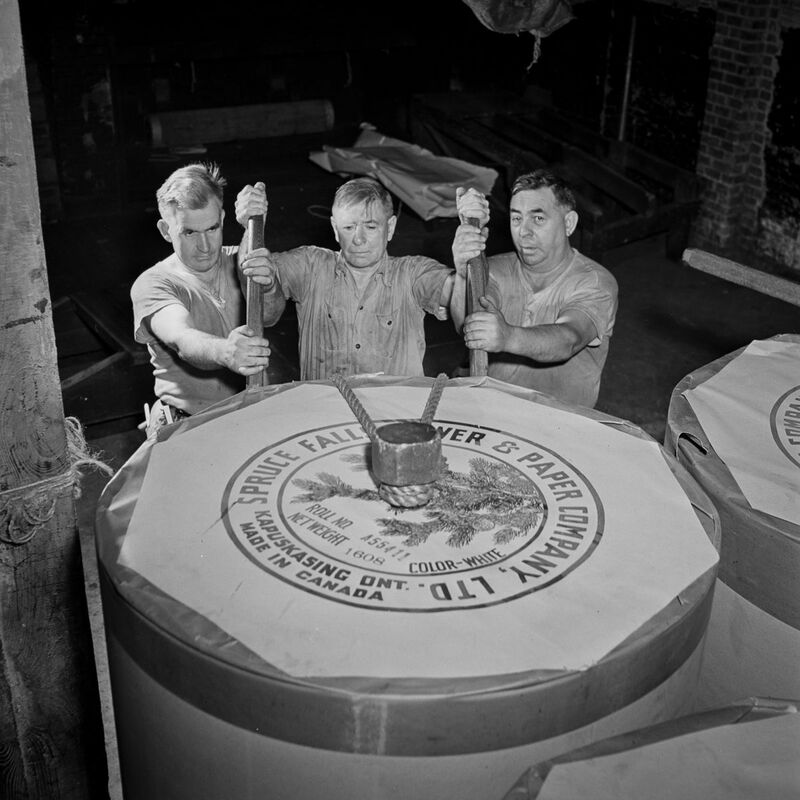 (Right) Plates are loaded into the presses before they start rolling. As the first editions come off the press, a pressman inspects for defects. Finished papers come out of cutting and folding machines on a rapidly moving belt. Every fiftieth is automatically slanted to facilitate counting. Finished papers are bundled for distribution. (Left) Papers are loaded onto a truck for distribution. 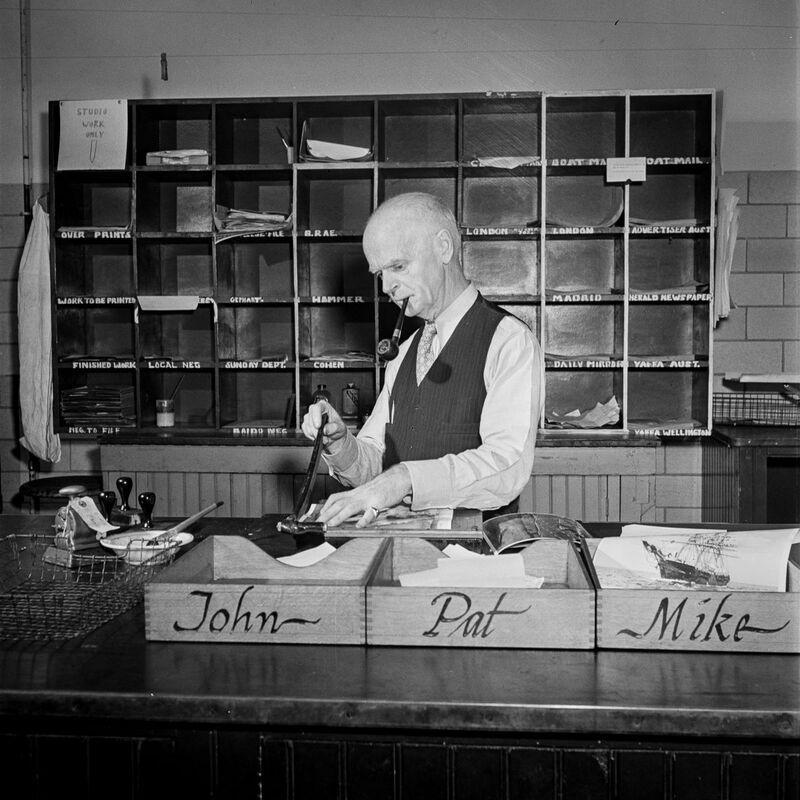 (Right) Bundles of finished papers are prepared for delivery. Pressmen relax in the reel room between editions.